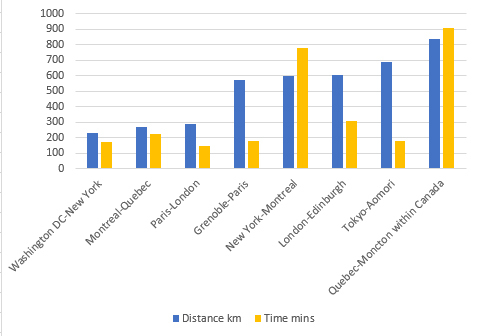 I'm taking a break from planning for a couple of days, but I did make these interesting charts comparing the train rides we'll be taking with some familiar standards. This chart shows train journeys in ascending order of length (blue bar). The yellow bar, which represents journey time, shows that there isn't much relationship between distance and the time it takes a train to cover it. The difference has more to do with a culture's decisions about how to invest in train transport. We can see that the long distance North American trains are notoriously slow, so slow, in fact, that they can only real function as tourist train, but the trains connecting the major cities of the east work more like trains in Europe. We can see the symptom of the UK's lagging behind in building high-speed connections between its major cities in the relatively slow, London-Edinburgh connection. Japan has the edge over Europe in high-speed connections but only just. But time/distance isn't everything. What about price? All prices have been converted to US dollars. The price for the overnight Canadian train is for travel only, excluding sleeping accommodation. The light red bar shows train prices in ascending order of cost per kilometer, BUT, and it's a big 'but', these prices are the cheapest you can possibly get. In Europe, you have to book weeks or possibly months in advance to stand a chance of getting the lowest rate. The dark red bar shows what you would pay if you tried to take a train in the middle of the day this coming Monday, booking only two days early. Prices in Europe regularly double or quadruple if you try to travel on a last minute whim. The cost of traveling from Paris to London on the Eurostar (in just three hours, admittedly) leaps to such astronomical heights that it distorts the whole chart. It's no wonder Eurostar's recent ad campaign vaunts the delights of spontaneity. Look what they expect to charge for it!!! 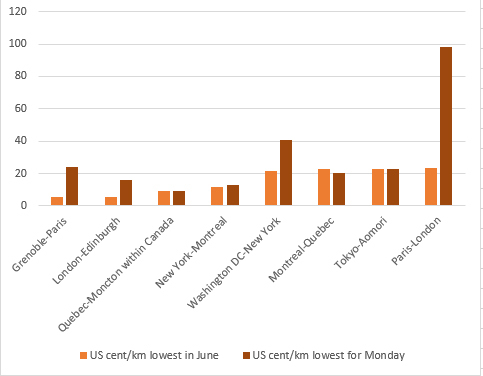 Meanwhile, Japan charges a single flat fee for its train journeys, no matter when you book, and the long North American train prices hardly shift, with the cost of Montreal-Quebec actually going down. In fact, I think this may have something to do with it being winter out there - not a good time for journeys that mostly appeal to tourists and holiday makers. Note that the Washington DC to New York price doubles for a late booking, but that's still better than the increases you get in Europe.